I dragged my feet getting to my eye appointment this morning - and that�s nothing new. I am perpetually late for my eye exams because of the stress that those exams cause me. Since the whole one in a million thing that forever changed the way I see the world, I get incredibly stressed out when it comes eye exams. And FTR, I HATE BEING LATE for anything because ironically, beings late stresses me out. The practice I go to is large, has offices in three states, and the staff at my office understands the stress I feel (and every other patient they see,) and are always incredibly kind. I drove faster than I should have and I was still 20 minutes late - and they still welcomed me with smiles. My eye pressure was great, digital scans looked good, and my Doctor was all sorts of happy and positive. At the end of the appointment when he asked me if I had anything I wanted to discuss. 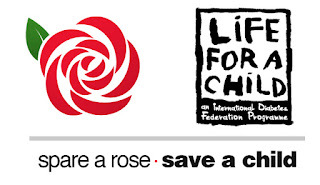 I mentioned that it was #SpareARose time again and that Valentines Day was next week, and that for the cost of one red rose, (actually, it's cheaper than a red rose -at least where I live,) they could save a life of a child with diabetes in need of insulin. Sidebar: For the past two years, the Spare A Rose Campaign always falls during one of my eye exams. Dr Eye: Break it down for me again, Kelly - I know we participated last year. I reminded them that if they went to SpareARose.Org, they would find that the cost of one red rose ($5,) would provide a bottle of insulin (a 1 month supply,) for a child in need. Dr Eye: And if I donated $10? Me: That would provide 2 bottles of insulin, and $15 dollars would provide 3 bottles of insulin, etc. The Doctor was enthusiastic about Spare A Rose and told me he was in. His Physician�s Assistant chimed in and said something along the lines of: This is really a great cause - I�m writing the website down and will go over it with the staff - I�ll also email the link out to my address book. Me: Thanks - that would be great - a little goes along way and $5 really does save a life. I thanked her again - for everything - and vowed that I would be on time for my next appointment. She laughed and told me not to stress. And as I sit here at my computer, still anime eyed and looking like I�m hopped up on the goofballs, I am thankful for all sorts of things, and feel happy and blessed to be able to pay it forward via #SpareARose.